Latavi is a breast enhancement pill and cream which is primarily marketed by radio and print ads. There are relatively little reviews on this product and it is only available on a few sites online. Latavi is basically a new product in the breast enhancement industry and is relatively unproven. In addition, this product is a little pricey at $89.95 per month. We would recommend choosing a more established brand at this price. 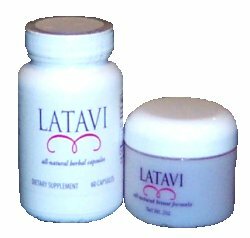 Latavi capsules come in a bottle of 60 total capsules, a 30-day supply and a 2 Oz jar of breast gel. Latavi is unique due to the fact that it is one of the few breast enhancement product on the market today that uses both a breast enhancement capsule and a breast gel. We have discovered that this external/internal approach has been extremely successful in some established brands such as Perfect Curves. Take two Latavi capsules daily and apply the breast gel once a day. Each bottle contains a one month supply of capsules and each jar of gel contains a one month supply as well. Although, we are big fans of the external/internal approach to breast enhancement which uses both a capsule and gel we did not find that Latavi offered the type of results which other products can achieve. Our testers did achieve a slight firming of their breasts and in certain cases a small amount of swelling, however, this subsided after a few weeks and their breasts soon returned to their normal state. Latavi is also a little expensive for a non established brand which lacks a proven track record.